One of the many engaging aspects of the The Helen Geier Flynt Textile Gallery (a permanent exhibition area in the Flynt Center of Early New England Life) at Historic Deerfield, are four half-scale fashion or dress 'mannequins.' 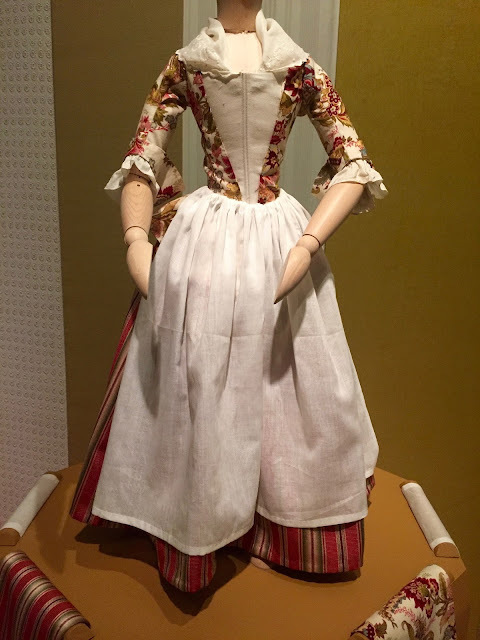 They are clothed in reproductions based on items found in the probate inventory of a young Deerfield woman, Sarah Williams (1716-1738), who died in 1738 at age 21. She was unmarried. 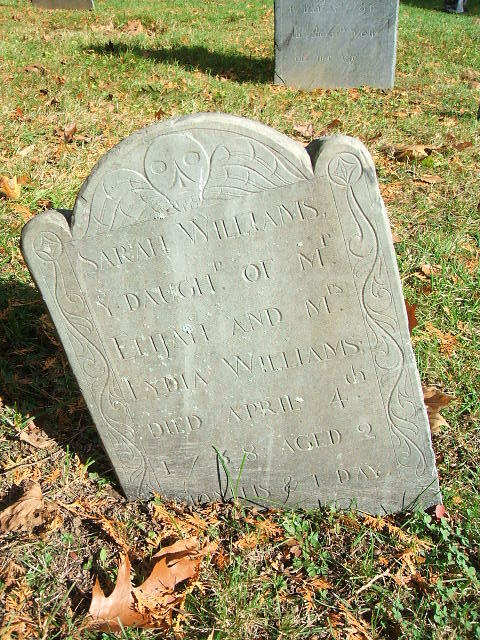 Her headstone survives at the Old Deerfield Burying Ground. 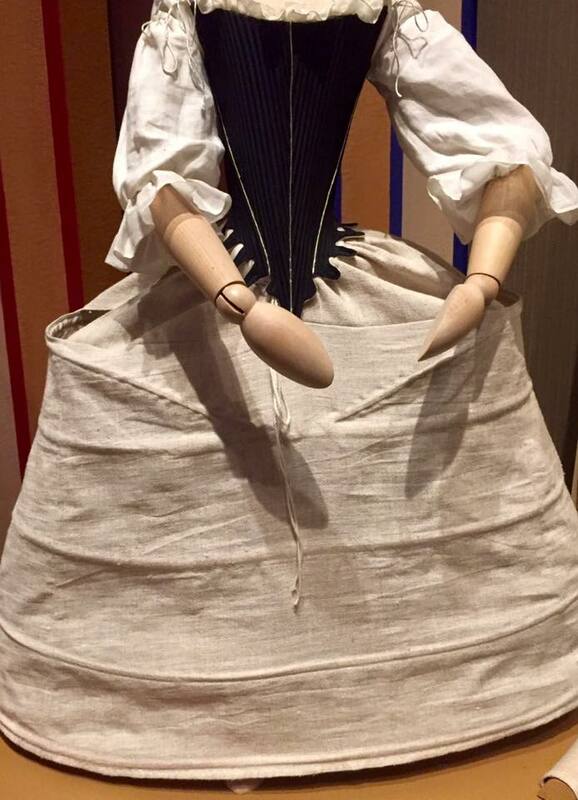 The model displaying "silk" (petticoat, open robe, stomacher) as they might have appeared from Sarah's garments. Miss Williams came from a very wealthy family as may be seen by the number and type of garments listed in her probate inventory. Among the extensive list: one taffeta robe at 6 pounds; one damask robe at 3 pounds 15 shillings; one chintz robe; one calico robe; one silk quilt; one shalloon quilt and cloth cut for a riding habit and trimming. The reference to one riding hood indicated it was quite costly at 4 pounds 5 shillings. 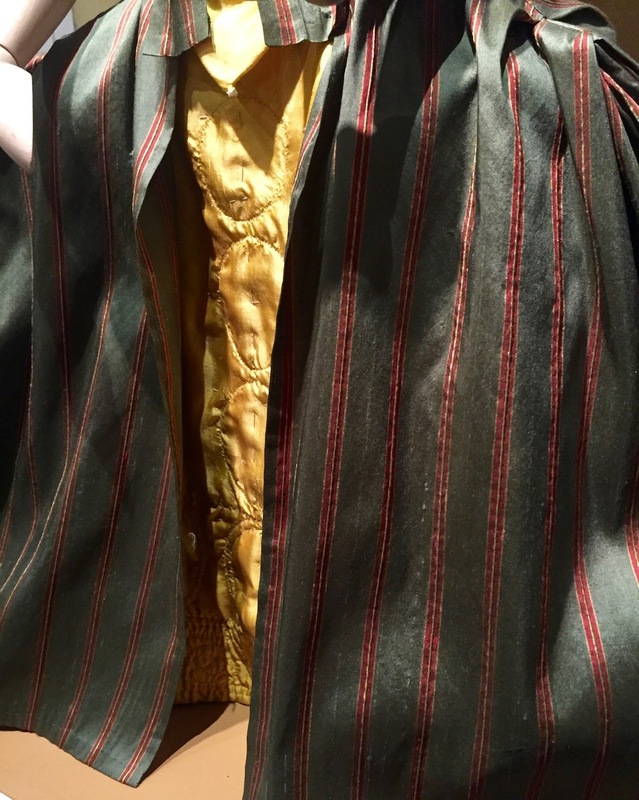 Her inventory also listed three pairs of stays: black, yellow and red. 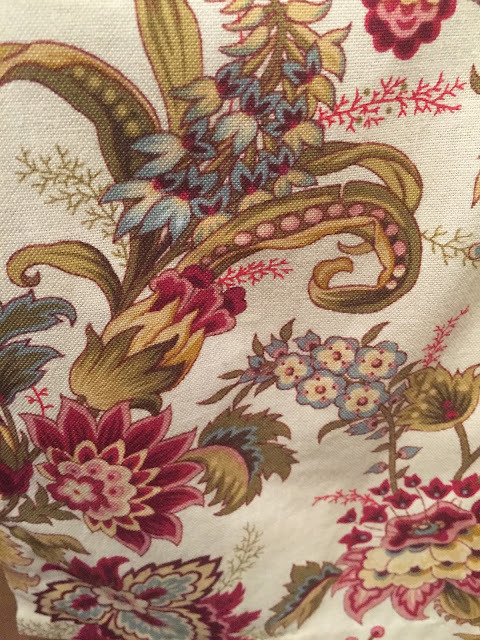 There are several references to unfinished garments or accessories perhaps indicating, in the case of “cloth for a pocket” that Sarah was sewing the item just prior to her death. The range of items available to Miss Williams in the 1730s certainly calls into question long held mythologies regarding colonial dress. 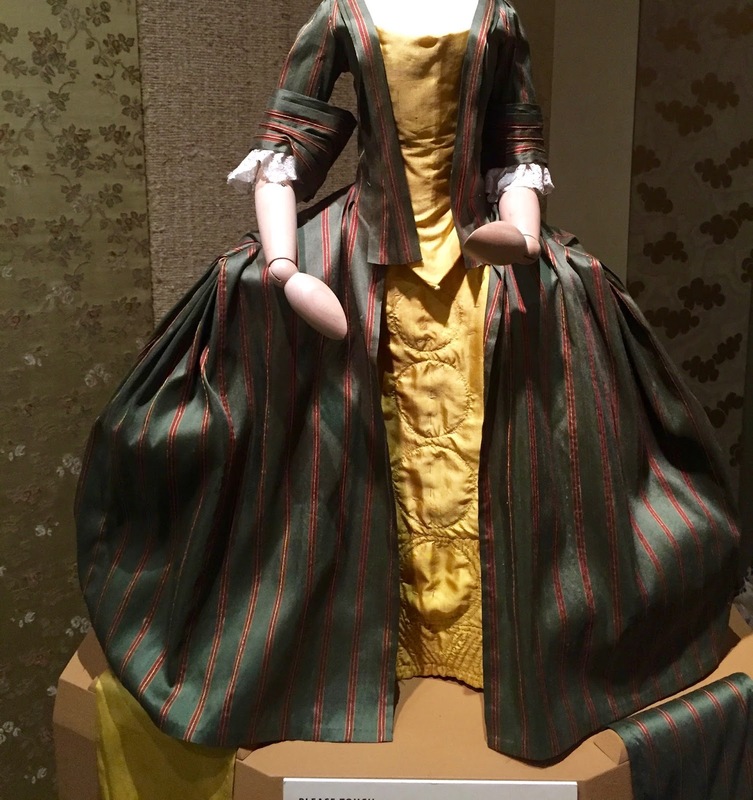 The Gallery is comprised of four sections representing silk, wool, cotton and linen and the theme is carried through with the half scale mannequins. Everyone should learn to tango in Argentina before they die. Going out this weekend? Dancing? Beware of the lascivious Tango warned the Ladies Home Journal in 1921! 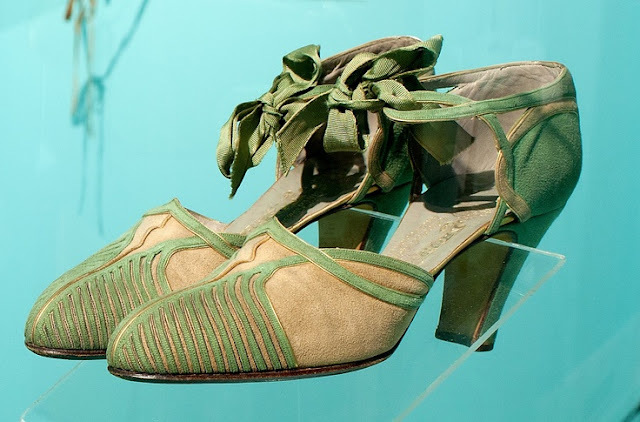 Shoes and boots like these, which usually featured criss-crossed laces, became know as Tango shoes in the early 20th century when the dance first flourished in America. The high, shapely heel flattered the ankle and leg as the dancer was "dipped" by her partner. These red, silk satin French-made “barrette/Tango boots” are in the collection of the Bata Shoe Museum in Toronto (http://www.batashoemuseum.ca) and date circa 1910s-1920s. Even if you do not fancy dancing, they just beckon you to have some fun, don’t they? In order to dance the Tango, the shoe needed to be well-fitted and secure. 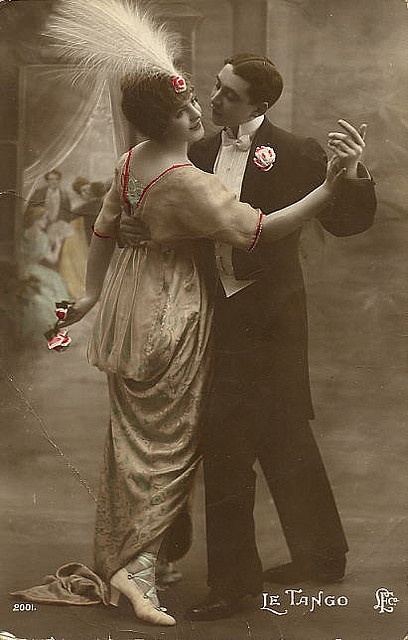 The lacing, or barrette-style straps, run up the ankle (and often the calf, as in this example) adding a provocative, sensual twist – appropriate for the dance itself. The designer, Nicholas Greco, is responsible for some lovely footwear in the 1920s and 1930s. Extant examples may be found in collections including the Metropolitan Museum and the Shelburne Museum (http://shelburnemuseum.org/visit/), such as this pair of suede and grosgrain, circa 1930.